Reviewed – Labour’s ‘Policy Announcement Tour’. With local government elections coming up in May, the Labour publicity machine has started out with a low key warm up tour of small towns and villages around the UK. In a break from tradition, and to help engage the ‘younger generation’, the ‘Policy Announcement Tour’ has been produced into a 45 minutes puppet show with Ed Miliband and Ed Balls taking the lead roles. Here is The Evening Harold’s review. As we walked into the auditorium the first thing that hit us was the huge attempt to distance the tour from previous ‘New’ Labour shows. In theory it was a good idea, but I personally think playing a remix called ‘things will definitely not get better (because that’s not what Tony said)’ was not quite the right message. The curtains were pulled aside to a silence of anticipation, and the show began. From the first line to the last, what became clear was the roles of our two main protagonists. 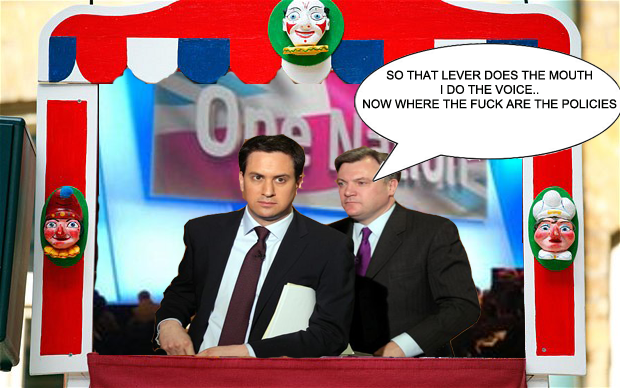 Miliband (left) was the mouthpiece of the double act with Balls (right) taking a ‘right hand man’ approach to the role. However it was soon clear that Miliband was being manipulated by Balls’ aforementioned right hand that was shoved up the puppets arse and was clearly in control. With the characters in place we were ready for the show to begin, and three days later, we are still waiting. For something billed as the ‘Policy Announcement Tour’ the show was filled with very little content. If anything it felt like a ‘best of’ show, with the crowd pleasing 10p tax rate used for the finale. In summary, I will give the show 2 out of 5 stars. The two star award is less a reflection of the show and more a nod to the unions’ ‘behind the scenes’ puppet manipulation skills and Balls’ ability to give the main character such a comedy voice. The biggest improvement the show needs is new leading characters, possibly recruiting from the US. On a final note I will say the show was not totally without incident and one person showed there still maybe hope. When it was clear the performance was dying on it’s arse, and the call for a doctor to help resuscitate it went out, Alistair Campbell stepped forward.